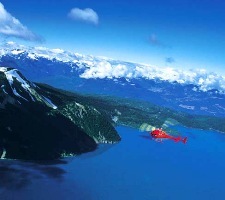 Experience a thrill of a lifetime while flying by helicopter over the beautiful Whistler Resort. Views of the incredible surrounding Glaciers, rivers, lakes and mind boggling Coastal Mountains will leave you with a lasting memory of Whistler. This flight-seeing adventure escape is an ideal adventure that the whole family will enjoy. To receive more Whistler activity information and a no obligation quote please follow this link to our Whistler Activities page .